As Operations Director at Calvary Women’s Services, it’s not unusual for Catherine Bisson to have her hands full. Catherine oversees all operations logistics at Calvary, and at this time last year, she was at the helm of the move for our residents, staff, and volunteers. As we celebrate one full year at Good Hope Road, Catherine recently shared her memories of the move. What was moving day like? What could have turned in to absolute chaos became one of the most unified efforts I have ever seen. The week was spent packing and unpacking—by staff and clients—and it was amazing to watch everyone helping each other. I have one very distinct memory of walking to the new building, and running in to a client who was very lost. We walked to the program together, and when we stepped inside, she turned to me and asked if this was really where she was supposed to be. To be able to say, “Yes, this is for you” made every hurdle along the way 100% worth it. What’s your wackiest memory of your first year at Good Hope Road? What many people may not know is that we have incredible views of downtown DC—from our roof! I know this because I unexpectedly spent some time up there with one of our vendors who insisted on climbing through the very small and difficult to navigate crawlspace in our ceiling. One of the great (secret) features of our new space! Favorite part of the building? Why? I love our dining room. It is incredibly bright and cheerful, and it always catches attention. When I give tours to new volunteers, I would say that 99% of them comment on how upbeat it is. 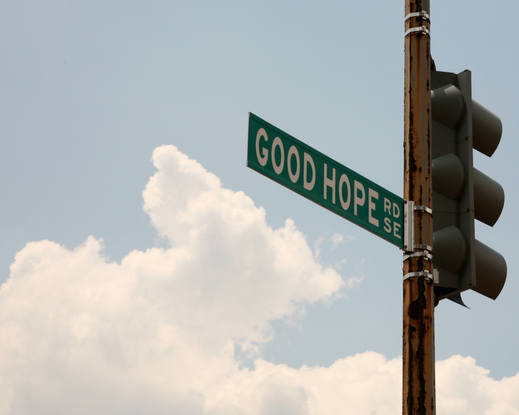 What are you looking forward to about our second year at Good Hope Road? Now that we’re here and we’ve had a full year of home-ownership under our belts, I see our second year marking a period of monumental growth for our services and volunteer program.